The global average temperature at the Earth's surface has risen 0.74 ± 0.18 ° C (1.33 ± 0.32 ° F) during the last hundred years (Rahmanelli, 2008). 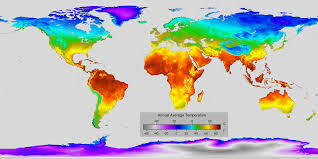 The Intergovernmental Panel on Climate Change (IPCC) (2007) stated the increase in global average temperature occurring since the mid-20th century, caused by rising concentrations of greenhouse gases. The Sun is estimated to have contributed to the increase in global average temperatures during the period of 1900-2000 about 45-50%. Stott (Rahmanelli, 2008) suggests that climate models that made the current guidelines make excessive estimation against the effects of greenhouse gases compared to the influence of the Sun. However, that increase the sensitivity of the climate against the influence of the Sun, mostly caused by greenhouse gases (GRK). Greenhouse gases are gases that occurs naturally and is a result of human activity. An example of the GRK is CO2 (carbon dioxide), CH4 (methana), N2O (nitrous oxide), CFC (chloro fluoro carbons), HFC (Hydro fluoro carbons), PFC (perfluoro carbon), SF2 (sulfur heksafluoro). If the GRK regardless to the atmosphere and to the height of the troposphere, the layer will form a "blanket" or "the trammel" greenhouse Earth. This greenhouse will reflect some heat from the Earth back to earth so that the Earth and the atmosphere becomes warm (Vardhana, 2010). It is believed that the existence of a powerful greenhouse gas is the most determining factor in the onset of global warming (global warming),. the phenomenon which is characterized by increasing the temperature of the surface of the Earth happens because trap radiation back ter emitted by the Earth, by the atmosphere, which allows the name of the "greenhouse effect" (green house effect). Some gases such as carbon dioxide CO2, H2O, dinitrogen oxide N2O methane, CH4, and similar gases chloroflurocarbon CFCS is considered to have great potential as a cause of global warming (Boeker & Grondale, 1995), either because the concentration nor its effect against thermal radiation received from the surface of the Earth. True to its name, the greenhouse effect is transparent towards the shortwave radiation (from the Sun), but updating the absorption of most of long wavelength radiation (from the Sun). The absorption wavelength of this great blocking back radiation by the Earth's surface, which causes Earth's surface temperature was higher. Thermal radiation transfer theory about the most simple enough reviewed based on interaction model of radiation directly between the Sun and Earth (Kittel & Kroemer, 1980). Based on this model, where the atmosphere is not considered a role it can be shown that the Earth will have average temperatures are very low,-to 180 c (225 K). If the Earth's atmosphere is seen as a medium layer of greenhouse gas that is capable of absorbing thermal radiation the Earth's surface with the absorption rate of 22%, it will be retrieved an average temperature of the Earth's surface, which roughly corresponds to the current measurements, 150 C (288 ) K (Levi, 1993) the increasing global temperatures is expected to cause many changes in the Earth's surface, such as the increasing intensity of the phenomenon of extreme weather or climate change. Climate change is one of the very serious threats against agriculture and potensialmendatangka2 new problems for the sustainability of food production and agricultural production systems in General. Climate change is a condition of some elements of the climate which the magnitude and/or intensity of her tend to change or deviate from the average conditions and dynamics, headed toward the (trend) (increases or decreases). The main cause of climate change is human activity (anthropogenic) that are associated with an increase in emissions of GRK.